If you have four days free in January 2016 and are looking for somewhere to go, why not check out the Illawarra Folk Festival with13 international, 77 national and 70 local acts strutting their stuff at over 12 venues. The Illawarra Folk Festival is the festival or all festivals. Photo courtsey of event organiser. 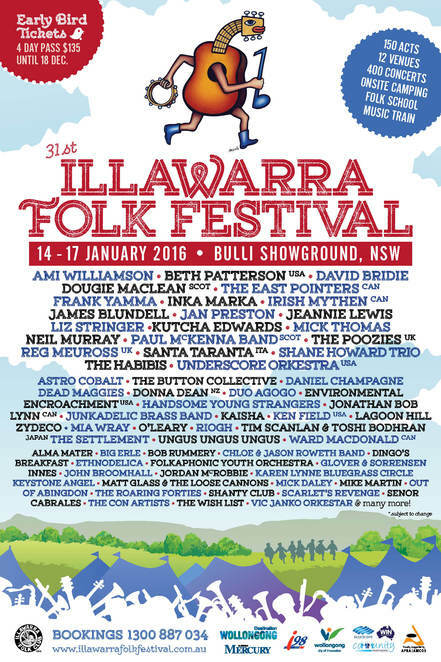 From the 14th to the 17th of January 2016 you can take one, two, three or four days to enjoy the 31st Illawarra Folk Festival, where you can listen to folk, world, roots, bluegrass, Americana, Balkan, gypsy and Celtic music, plus poetry, comedy and dance thrown in for good measure. Along with all this music and dance, you can also sample a colourful array of international food stalls and peruse craft stalls. Whether you are a local or coming from afar, to make it easier for you, the event organisers have limited on-site camping for small and large tents, small and large camper trailers, small and large camper vans and small and large motor homes. This festival has long attracted international and national performers, who have helped establish it firmly on the national music calendar. 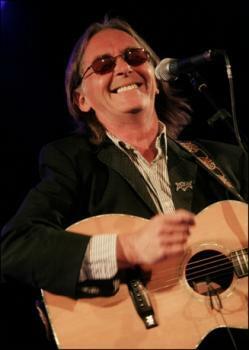 Dougie MacLean. Photo courtesy of event organiser. Scotland's finest singer-songwriter is internationally renowned for his song 'Caledonia', music for 'Last of the Mohicans' and inspired performances. He has received two prestigious Tartan Clef Awards, a place in the Scottish Music Hall of Fame and an OBE in the New Year Honours list! I listened to some of his music on-line and it reminded me of when I was back in Scotland. Jonathan Bob Lynn. Photo courtesy of event organiser. As a kid growing up in Ireland, he regularly helped my dad rehearse lines as he prepared for another role in amateur theatre. It was then he beheld those written words as they burst into life in performance and he was hooked forever. I thought this would give me a good laugh. Junkadelic Brass Band. Photo courtesy of event organiser. Hailing from Perth, Western Australia, Junkadelic combines a smoking hot 6-piece brass section with a hard-hitting recycled percussion section to bring you a face-melting blend of street rhythms. Taking inspiration from traditional New Orleans street music, Junkadelic combines tasty funk grooves with Latin and hip-hop flavours. Both my son and daughter played in several brass bands and this would bring back memories. • John Littrich & The Water Runners. 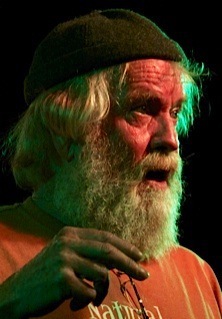 John Littrich & The Water Runners. Photo courtesy of event organiser. John and his band of South Coast musicians join forces to play their own brand of contemporary folk that lightens the heart and moves the feet. These guys just look cool. The Con Artists. Photo courtesy of the Con Artists. The Con Artists are a carnival of percussion, wind, brass, accordions and fiddles. Conceived in September 2010, The Wollongong Conservatorium of Music's all ages community band combines young up and coming Conservatorium students, adult community musicians, and some of the region's most prominent folk musicians, playing music from around the world. Quite a few years ago, my son had the opportunity to play down at the Wollongong Conservatorium of Music. 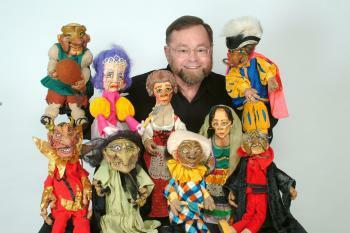 Dennis Murphy's Puppets. Photo courtesy of event organiser. Dennis Murphy's Puppets have taken the centuries-old Commedia dell' Arte tradition from Italy and made it accessible to a modern Australian audience. Arlecchino is one of Europe's favourite clowns, who entertains both young and old. Children love the silliness while adults appreciate the witty one-liners. Who doesn't love a puppet show? Now that I have given you what I would be interested in seeing, why don't you go to the 2016 Artists and Lineup program and have a look at how you may like to go a see. Click here to see the program for 2016. If you live locally, you could walk, ride a bike or go in a car, but have you ever thought about catching a train from Central Station and riding it all the way down to Bulli Station. From here it would only be around a ten minute walk to the festival. At the time of putting this article together the schedule of who will be performing on the train has not yet been released, but if you click here you will be able to get an idea of what went on in 2015. The train trip will only be operating on Saturday and Sunday. To help you get into the swing of things before the festival, the Illawarra Folk Club has been putting on a number of events during October 2015 through to the festival in January 2016 featuring a number of Festival artists. It's to form part of the build-up to the festival. But if you miss some of these, the Illawarra Folk Club run regular events throughout the year, so I would suggest that if you are interested you should like and follow their Facebook page. • Honk! Oz – A three day event from Friday the 8th of January. • llawarra Folk Festival Folk School - A two day event from Tuesday the 12th of January. • Vin Garbett from the UK – Friday the 5th of February. 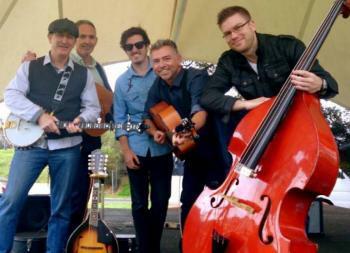 • The Rambling Boys from Ireland – Friday the 4th of March. • Alistair Brown from the UK – Sunday the 6th of March. It looks like the Illawarra Folk Festival has everything covered. Remember it is now in its 31st year. So what are you waiting for, whether you are going to go for a day or four, I am sure that you will have a great time at the 2016 Illawarra Folk Festival! Book now to get those early bird prices. Why? Be prepared to get your music senses blow away. When: Starting and finishing times will vary. You will need to check the program when it comes out. Cost: Cost will vary for each activity. Check web site for details.